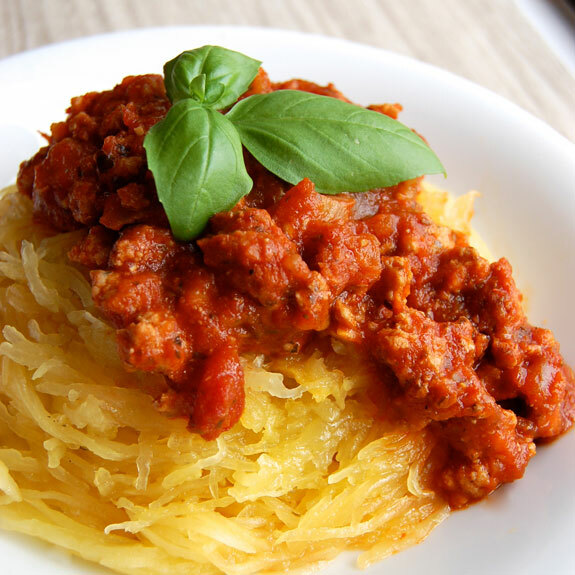 The very aptly named spaghetti squash provides a tasty, healthy substitute for regular pasta. It is the perfect solution for the weekly spaghetti night, one that the whole family will enjoy. Dovetailing tip: Use the Italian Sausage that you browned for Meal 3. Saute the onion and garlic in coconut oil, then add the cooked sausage. Continue as directed. While the spaghetti squash is roasting, melt coconut oil in a large skillet over medium heat. Add chopped onion and garlic and cook for 4-5 minutes. Add ground Italian sausage and brown the meat, stirring occasionally. Season with salt and pepper. Add the chopped tomato, tomato sauce, and Italian seasoning and stir to combine. Simmer on low heat, stirring occasionally, while the spaghetti squash finishes roasting. Serve over spaghetti squash with basil for garnish.